As of late, I've been obsessively pondering one question: Is gender neutral style always empowering to me? The answer, I'm realizing, is pretty complicated. I'm a non-binary person, so androgyny in fashion is a topic of utmost importance in my life. With the gender fluidity that defines so much of my identity getting attention and visibility in the sartorial world as of late, my self-esteem around my own gender presentation has improved vastly. Slowly but surely, facets of the fashion world are considering people like me in the way they make, market, and sell their clothes. But even with folks like model Rain Dove inspiring me to abandon any gender-based insecurities, and despite androgyny being "on trend" and brands subsequently producing ungendered lines, there is still much to be done and improved. Trans visibility is definitely at an all-time high, which I'm profoundly grateful for. But considering fashion has arguably played a major role in gender oppression, historically speaking, working the kinks out all at once isn't likely to happen. It's incredibly difficult to break out of narrow definitions of gender and androgyny to create or wear clothing that is truly inclusive of all gender identities (particularly if you're cisgender and don't have a lot of knowledge about the needs of other identities). But here are some of the ways in which I would love to see androgynous fashion improve and progress. Apparent in Zara's Ungendered Collection and in many gender neutral lines before it, androgyny is often equated with masculinity, or women "borrowing from the boys." The above image is a good representation of what we generally see when fashion talks "androgyny:" Cis-passing women modeling loose and boyish neutral-hued clothing. This is important, of course. But the actual definition of the word implies an even balance between the feminine and masculine, or an absence of either. Ultimately, it should be a descriptor that gender nonconforming people could be comfortable using. But "androgyny" as it's often expressed in fashion does not actually represent a full scope of gender, nor does it speak much beyond women wearing masculine apparel. Personally, my androgyny looks like something different every day. I don't identify with either male or female genders, so whatever presentation I choose at any given moment (even if it's feminine) is androgynous to me. It should be perfectly OK to include more traditionally feminine clothing in a gender neutral line. Androgyny is about letting go of restrictions and gender binaries, not creating new ones. That being said, androgynous fashion is usually pretty lacking regarding the opposite binary: Feminine clothing for more masculine people. It's so incredibly rare to see dresses or skirts advertised for anyone not AFAB. However, it's pretty common for suits and sweats to target a more feminine audience. Feminine people AMAB already deal with enough stigmatization regarding presenting femininely. Androgynous and gender neutral fashion as I understand it is meant to push boundaries and break the binary. So let's be sure to include all people in this mission as we move forward so we can someday end the stigmatization of femininity — one dress at a time. While major retailers like UK department store Selfridges and Target have made moves to remove gendered divisions from their aisles, we need to see more radical work in the sizing department. Clothing and shoes typically have different sizing systems based on the targeted gender, which can feel pretty restrictive to someone like me who wants to hit the mall, too. In the women's department, I'm a size eight. But in the men's department, I'm a size 29. In order to make gender neutral fashion more accessible, consolidating units of measurement in clothing without gender differentiations feels like it would be a great step in the right direction. I'd love to see more brands producing chest binders — which are currently few and far between. At the moment, Shape Shifters is one of the only brands designing binders that feature fun prints. But it'd be amazing to see these binders in a variety of colors, sizes, and styles as well. Designing some that could be built into tops or marketing them as precious crops would certainly be well-received by much of the GNC community. 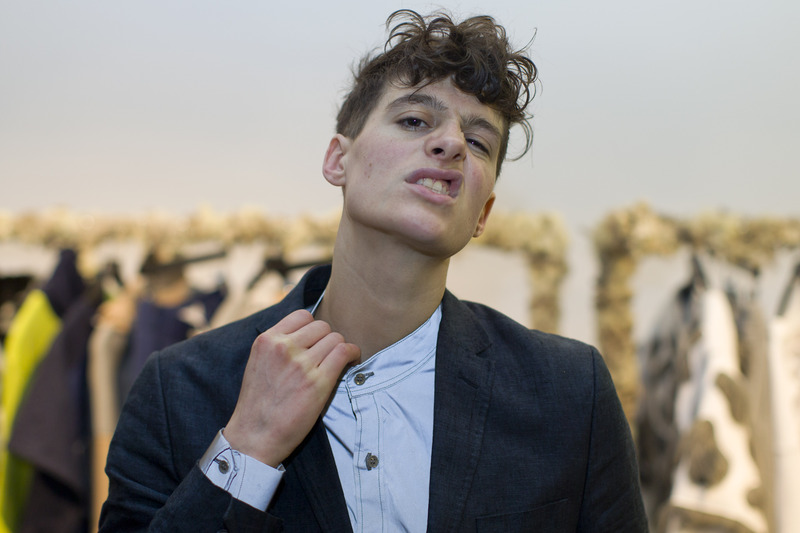 I adore Rain Dove, and greatly appreciate the visibility people like her are generating for androgynous fashion and GNC identities. However, I'd love to see masculine people with feminine presentations take Jaden Smith's lead and become frontrunners of the movement, representing a greater scope of gender neutrality. I've yet to encounter a beauty brand or makeup line created specifically with gender nonconforming people in mind. Even with all the strides we've made in trans visibility, makeup is still largely a cis woman's game. I try to keep this in mind, especially when I'm shopping with my partner (a makeup-loving human who was assigned male at birth). Although the lack of GNC visibility in the beauty game affects us both, I feel particularly upset on their behalf. Since I have the privilege of being assigned female at birth and can pass as a woman, I'm often welcomed into beauty-oriented spaces without judgment. Although my partner still strides through most makeup stores trying everything on, it would feel incredibly progressive if the brands we love could consider us in their marketing. Part of making all identities feel catered to when trying to sell a product is including a myriad of people as the faces of the brand. I love Obsessive Compulsive Cosmetics for this reason (along with the fact that its makeup is such high quality and very fulfilling of my queer color palette). The brand often uses men and bearded humans in its ads and social media outlets to advertise lipstick. And despite the sometimes negative reactions these choices can generate, OCC is reflecting a true sense of gender diversity and successfully attracting gender fluid people to the products. It's simple: We want to care about brands that care about us. Pregnancy and motherhood are still highly feminized, so maternal clothing is pretty limited for gender nonconforming people and masculine women. I'd love to see more gender neutral maternity brands, like Butchbaby And Co., that could provide expecting parents with clothing to match their personalities and gender identities. Although brands like Bindle And Keep, Flavnt, and Gender Flux thankfully exist, their items are often beyond the budgets of most Millennials. It's incredibly important to support these indie gender neutral brands if you can. But at the same time, we need to see more clothes like these in the context of department and fast fashion stores that make affordable clothing accessible to the average American. As with plus size clothing, there's no reason gender neutral apparel should be a rare commodity. If we're really committed to making fashion more inclusive of all genders, we have to make a real effort to shift our thinking in not only how we perceive androgyny, but gender as a whole. Gender isn't as simple as boy versus girl, and fashion isn't as simple as suits versus dresses. Let's commit to a genuine effort at learning the needs of androgynous, non-binary people and figuring out how we can make the world (and the clothes they wear) more reflective of their identities and experiences. Want more gender fluidity? Check out the video below, and be sure to subscribe to Bustle's YouTube page for more inspo!